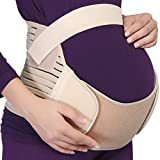 Back pain during a pregnancy can be caused by many different variables including hormonal fluctuations, developing a new center of gravity, and lifestyle changes. For some women, this pain is so strong that it will bring every facet of their life to a grinding halt. Here is a look at three ways that expectant mothers can quickly and safely lessen their back pain without putting their baby at risk. Many women are able to completely rid themselves of back pain by rethinking their clothing options. At the very least, you should invest in a comfortable pair of shoes that support your back and have room to accommodate for swelling. Another popular option for women who have back pain is a belly band. Recent studies have shown us that these unique products have many different benefits including improved support for the hips, back, shoulders, and neck. You also need to avoid tight clothing that cuts off your circulation and restricts your movements. As you continue to gain weight, your center of gravity will constantly change. That is one of the reasons why it is so important for expectant mothers to focus on good posture at all times. Some of the bad habits that you had before your pregnancy can end up causing you a tremendous amount of pain once the baby begins to grow. When you are sitting or standing, you should keep your back relaxed and have your chest held high. While it might seem easier to lock your knees and slouch to support the weight, you need to build up the muscles in your legs and midsection to keep your spine straight. Many women never even consider heading to a chiropractor during a pregnancy, but these medical professionals can be beneficial to mothers as well as their babies. All chiropractors must take courses that teach them how to safely and effectively treat pregnant women. In addition to helping you alleviate your back pain, they can also help you with other issues such as general swelling, headaches, and joint inflammation. Women who are experiencing ongoing pain or inflammation should consider heading to the chiropractor, like the professionals at Fulk Chiropractic, at least twice a week for joint manipulations and spinal adjustments. Even if your back pain has become quite a nuisance, expectant mothers should never reach for any painkillers until they have spoken with a doctor. Women who are struggling with debilitating back pain must immediately head to the emergency room. It is especially important to seek out medical assistance if the back pain is accompanied by any other side effects such as a migraine or chest pain.